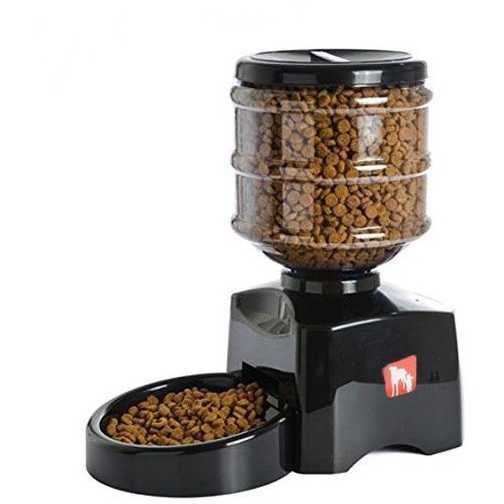 If you are reading this article, and looking for more information about the best dog food vending machine, you are probably part of that large group of people who often have to stay away from home , and who do not know how to take care of their friend at four legs . Nowadays, because of the work and the numerous daily commitments , it has become a necessity for many masters to have to leave their dog alone at home. It is not always possible to ask for favors from friends and relatives, begging them to come and check our puppy during the day, and feed him. That’s why the vending machine was invented, and why it’s so popular among pet owners ! Thanks to technology , in fact, feeding your dog will no longer be a problem. You can plan the time and amount of meals, so that when you are not home, your pet can eat regularly without problems. In the following paragraphs we will list the 5 best dog food distributors, we will go into more specific about their functioning and we will tell you why you should definitely buy one. We will give an answer to all your doubts and questions; so that, you and your four-legged friend, you can fully benefit from the new “helper” with meals and you can spend more time together having fun! In the following list we will recommend the 5 best dog food distributors on the market , which can be purchased through the various online stores. Including both the cheapest products with the lowest price and the slightly more expensive ones, the distributors we will describe to you have been selected after a long and careful research. We also urge you to read the opinions and reviews of customers who have already purchased these items, so you have as many items as possible to add to the evaluation of your choice. To do this, simply click on the links placed after the description of each product. The first product on our list is the WOPET vending machine . Able to dispense up to 10 servings of 10g each, this power supply is perfect in case you need to leave during the weekend. You can set up to 4 timers per day and choose the portion size quickly and easily and the unit delivers dry meals. The LCD display will allow you to easily select the adjustable settings and the magnetic lock of the cover. The dimensions of this distributor are equivalent to 9.8 x 13.7 x 15.3 inch, with a volume of 7L, a wattage of 5 watts and a voltage of 5 volts. Created in ABS material and with a net weight of 4.63 pounds, the WOPET distributor is powered by 3 alkaline D / DC batteries and is only suitable for dry food . The C’est automatic feeder , thanks to its built-in microphone, allows you to record a message , so that every time the meal is served your dog will be notified immediately. The LCD display with timer will make meal planning a breeze. 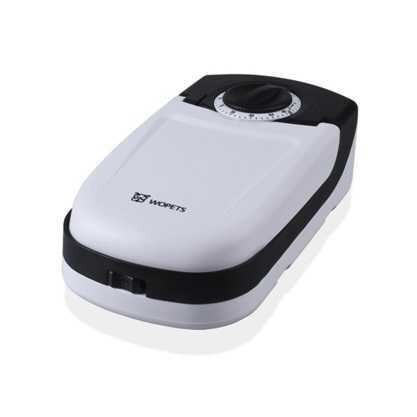 As for its capacity, it can hold up to 6 meals and you can set up 4 daily timers . 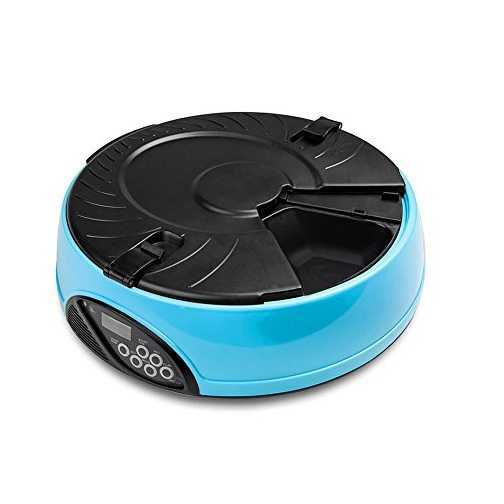 Simple to clean , this feeder has a secure closure that will not allow your dog to reach un-released food. Also made of ABS material, it is extremely impact resistant and will last longer. Its dimensions correspond to 33.4 x 33.2 x 11.8 cm, has a weight of 1.6 kg and is powered by 4 type C batteries. The digital food dispenser of MVpower , thanks to its capacity of 5.5 liters, is able to distribute to 3 times per day, up to 12 portions of food . This means that you will not have to worry about feeding your dog for 4 days. The dimensions of this distributor are 29 x 22 x 49 cm and is powered by 3 batteries that will last about 3 months. 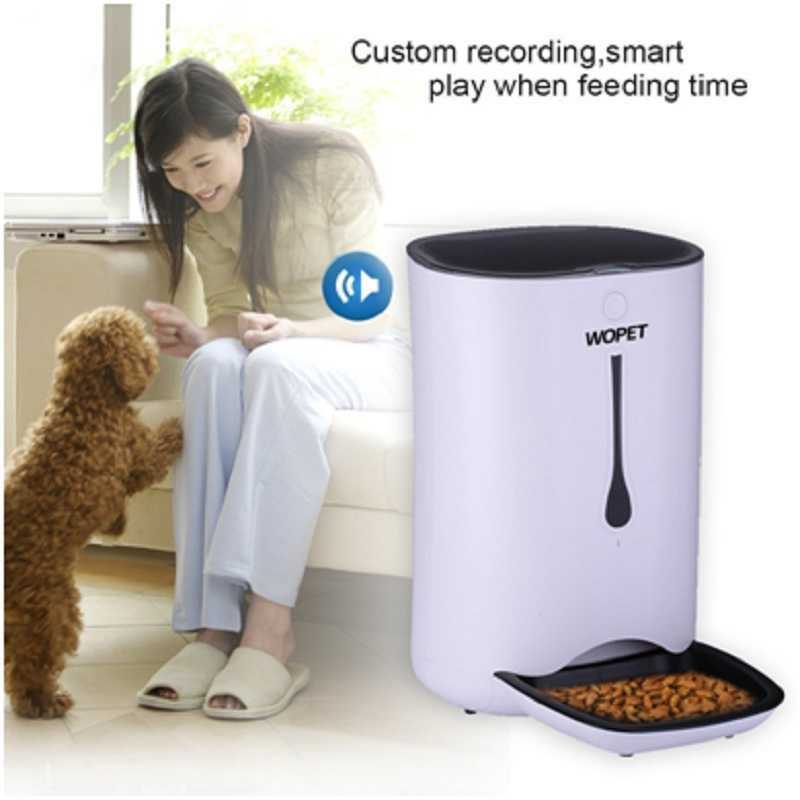 Also this model is only for dry food and allows you to record a 10-second voice message for your pet. The PetSafe vending machine has an electronic timer that allows you to set up to 5 meals in advance , with a maximum weight of 230 g.
Great for handling portions and checking the quantity , this feeder is only for dry food or biscuits , and the trays it is made of are easy to wash , even in the dishwasher. It is powered by 4 D batteries (not included) that will last around 6 to 12 months. Extremely robust and compact , dog-proof, this distributor will guarantee you safety and punctuality in serving meals to your puppy! The latest product on our list is the WOPET dog food vending machine . This feeder is recommended mainly for small dogs or puppies, since it would not resist the bumps of a larger dog. Able to guarantee 2 meals for the next 48 hours , the model of the WOPET, allows you to place an ice pack in order to keep the food wet. The simple timer, similar to a kitchen timer, will also make meal planning easy and immediate. It is powered by an AA battery not included and its dimensions correspond to 27 x 7 x 24 cm. What is an Automatic Food Dispenser for Dogs? A vending machine for dog food, is exactly what the name suggests: a dispenser that automatically releases food for your pet , through an electronic pre-programming or by means of gravity . They are generally made up of two parts: an upper piece of glass or plastic that contains food before it is released, and a plastic, ceramic or steel bowl where the dog can eat the food that is served. Why Use an Automatic Dog Food Distributor? Dog food vending machines are extremely useful for owners who work mainly outside the home, the disabled or the elderly . When these distributors are pre-programmed, they can help you manage the amount of food your dog eats and, consequently, keep his weight under control. This will prevent your puppies from contracting diseases such as diabetes from which, unfortunately, many dogs are affected precisely because of poor eating habits . Dog food vending machines will give you confidence that your four-legged friend will never miss a meal, no matter where you are. Electronic feeders will allow you to plan meals and manage portions , to control weight or any medical conditions of your dog. The integrated portion measurement function will absolve you from this demanding but, let’s face it, boring task. Dog food vending machines will ensure that you no longer have to ask for favors from your friends or relatives to feed your pet when you are not at home. The use of the dog food vending machine is sometimes criticized because it replaces human contact in the animal’s life. However, this can be disproved with the fact that you will take advantage of the time saved by feeding it, spending more time playing with it. The ability to program more than one meal a day. Being able to manage the amount of portions depending on the habits and needs of your dog. A simple and intuitive programming . An easy to clean bowl and top . It must be strong enough to be able to resist the strength of your dog when it pushes or impacts it. There are several types of automatic distributors of food for dogs, but mostly we can divide them into: electronic vending machines and vending machines gravity . Electronic vending machines give the master complete control over the quantity of food and the time of the meal. In fact, these types of distributors are pre-programmed to release specific quantities of food at specific times of the day. Being able to manage 360 ​​degrees what your dog eats, at what time and in what quantity . This will also help enormously to reduce accidents of overeating and obesity . Small and regular amounts of food promote digestion. The vending machine will ensure that the amount of food for your pet is always the same , every day. Neither more nor less. The only possible disadvantage , however, is to find programming errors , especially when using low quality products. Gravity vending machines use, precisely, the gravity principle to serve food to your pet. 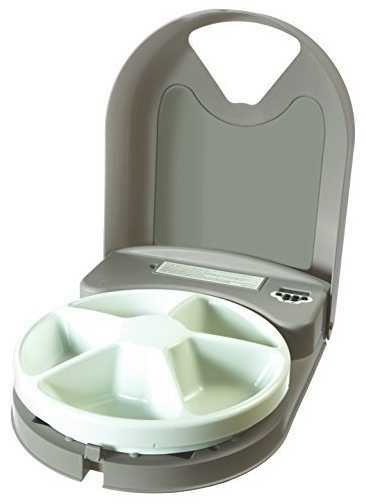 This distributor will fill the bowl every time your dog will eat the portion previously served. When the bowl is full, the dispenser will stop feeding the food. The advantage of this type of distributor is that it requires no programming to feed your puppy; you will therefore be 100% sure that no error or malfunction will be required and your four-legged friend will always have a full stomach . This, however, also leads us to the only disadvantage: the animal will have a complete and free access to all the amount of food that will eat, which could lead to obesity . Vending machines help us by feeding our puppies when we can not get home in time for the meal, but these are not a substitute for the love and attention our pet needs. Dogs, in fact, need to be taken out at least a couple of times a day to do their own needs , and they require a great organization in case you have to stay away from home for a long time. First of all, keep in mind that puppies should never be left alone at home without being supervised or ” fenced ” until they are properly trained. Larger dogs can stay at home alone for up to 8 or 10 hours , depending on how much they can hold it back, but never longer. You can program a vending machine to feed your pet and speed up your daily routine , but nothing can replace human affection and regular pee walking! How was the Food for Animals born? The first food created specifically for dogs, was invented by an American electrician named James Spratt in 1850. While he was visiting London, Spratt noticed that crewmen enjoyed throwing food leftovers to hungry groups of dogs. From this, and from the growing number of animal owners in the city, he thought of creating cheap dog biscuits, easy to serve. Launched in the market in 1860 , the biscuits created by the American electrician, were a huge success and allowed Spratt to start production in the United States , giving life to the first food industry for dogs . At the beginning of the twentieth century there was an explosion of new dog biscuits on the market, which created a great competition . Immediately after the First World War, he also heard the dog food in box of Ken-L-Ration . These horse meat cans became very popular as a method to reduce the excess of horses in circulation after the First World War; but, in the first half of the thirties, the product was so successful that Ken-L-Ration began to breed horses specifically to produce dog food, slaughtering up to 50,000 per year. Canned dog food put 90% of the market behind the wall until the government began rationing meat and tin during World War II, paving the way for modern dry dog ​​food . campaign to educate customers about the dangers of giving food leftovers to their pets, and the benefits of buying pre-packaged dog food . These extremely convenient foods allowed working families to feed their four-legged friends more easily, while keeping them healthy , without having to worry about wasting more time preparing food. There are three things to consider when choosing a dog vending machine. How many days before you want to be able to plan meals, how many servings you can serve, and whether it can be used for both dry and wet foods, or just dry ones. Programming : it is possible to buy distributors with timers that can program meals from 24 hours up to 30 days in advance. The most basic models will allow you to set a single time at which the distributor will open; while, the more advanced models, will allow you to plan meals at different times of the day. Distributors with a capacity of around 10 liters will feed your pet for a fair number of weeks. Type of Food : generally all distributors are good for dry food, however many models can also be used to serve wet ones. Some, even, allow you to place an ice pack inside to keep food wet in the cooler, longer. Extra functions : some distributors give the possibility to record short vocal messages that will be executed when the timer will mark the programmed meal time. This can help your pet understand when their dinner is served.